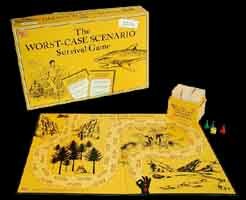 Play The Worst-Case Scenario board game and find out just exactly who amongst your friends you would most like to be stuck in the middle of a jungle with. Who would come through and who would just fall to pieces. The game itself is very basic. You get a board, a die, some counters and a box of questions. You star off by throwing the die and then being asked a question which has a choice of three possible answers. Sounds easy, but it isn't. We played this game in the office for a whole afternoon and by the time our working day was up four of us decided to stay on, order a pizza and a few beers and play on till nine in the evening. This is the perfect game for after dinner parties and works really well with couples competing against each other - you can imagine the arguments now can't you? I have been asking some of the questions that came up to my friends and family and I have also been boring complete strangers with some of the facts that I have learnt. For instance I went shopping last week and as I got into the lift I noticed a very scared looking woman against the back wall. "Scared of lifts?" I asked. When she replied that she was I simply informed her the best way to survive should our metal box plummet to the ground floor. For some reason this didn't make matters any better and she got off at the next floor and walked up the stairs. Sadly I have to leave this game in the office for everyone to play, but I can tell you one thing - I am going to hunt one down to play with at home.